Carbohydrates are one of the major food groups that our bodies need to function properly and stay healthy. The function of carbohydrates is to act as a fuel source to give your cells, organs, and tissues energy. All types of carbohydrates, whether they are simple carbs or complex carbohydrates are turned into sugar (glucose) and used by the body. Some of the best and healthiest sources of carbohydrates are whole grains, starchy vegetables, and legumes. These complex carbs are healthier because they provide the body with a slow release of sugars and prevent sharp spikes in blood sugar levels. In fact, some people are surprised to find out that eating healthy carbs can actually help lose weight. Simple carbohydrate foods provide a quick release of energy and these are found in white bread, cakes, cookies, and processed food. These types of simple carbs should be consumed in limited amounts. There is much discussion about the role of carbohydrates in weight gain and increased blood sugar levels. In this article, you will find out the true function of carbohydrates and why carbs are important in body functions. You will also learn why some forms of carbohydrates should be limited to help keep you fit and healthy. 1. Sugar. This is the simplest type of carbohydrate and is quickly used by the body as an energy source. Sugar is found in many fruits, vegetables, and milk products. It is also extracted from sugar beet and sugar cane and made into table sugar. 2. Starch. Starch is a complex carbohydrate. This means that the sugar molecules are bound together in long chains and take more time for the body to use them. Starch is found in grains, peas, beans, and vegetables. 3. Fiber. 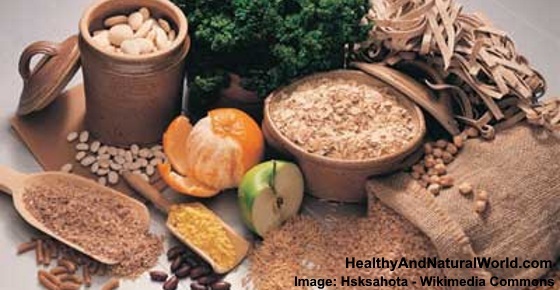 Fiber is also a complex carbohydrate that the body can’t digest. Fiber is found in fruits, vegetables, legumes, and whole grains. The body needs these complex carbs to maintain a healthy digestive system. It also helps you feel fuller for longer. When searching online for the role carbohydrates play in diet or what a “low carb diet” is, you may come across the term glycemic index (GI). Doctors at the Mayo Clinic say that this signifies the potential the carbohydrate has to raise your blood sugar (glucose) levels.2 Most complex carbohydrates have a low GI, and you can find more information about it in my article on how to reduce your glycemic index (GI) and lose weight. There are many important functions of carbohydrates in the body. Carbs not only give you energy, but they also help to reduce the risk of disease, improve your immune system, assist the body in absorbing protein, and help to improve digestion function. The body needs carbs to fulfill its energy needs. The sugars and starches from food metabolize in the body to be used as a source of energy. Having the right balance of carbs is important for the body because it helps the body to use protein and fat for purposes other than for fuel. Protein is broken down into amino acids which are needed for growth, making hormones, keeping muscles strong, and helping the body to repair cells. So, if you decide to reduce the number of carbohydrates in your diet, it’s important to consume more protein so that your body doesn’t lack the important amino acids it needs to function properly. Good, healthy carbohydrates provide an essential function in helping to reduce the risk of developing chronic diseases. For example, foods containing fiber help to keep your digestive system working properly and prevent constipation. The fiber content in many complex carbohydrates doesn’t just keep your bowels working properly. Healthy carbs help the body regulate its whole gastrointestinal function. If you suffer from gas, bloating, and stomach pain after eating, you can try the low FODMAP diet. This diet consists of foods that are easily absorbed in your digestive system and prevent gas, bloating, and abdominal pain. Please read this article for more information on the low FODMAP and how it can prevent many digestion issues. Carbs tend to get talked about in a bad light when it comes to weight loss. But, just as there are good fats and bad fats, so there are carbs that benefit the body and help with weight control and carbohydrates that can do the opposite if you consume too much of them. When it comes to weight loss, many people have actually found that a low-carb diet can be beneficial in shedding extra pounds. Diets low in carbohydrates are high in protein-rich foods. This forces your body to use fat for energy and thus help you lose weight. You can find out more information on the benefits of low-carb diets on this website. Carbs help improve the flavor of many foods. Most of us know that foods that contain simple carbohydrates are tasty and hard to resist. We also know that eating too much sugary foods is bad for our general health. However, scientists have found that most of us can taste the starchy carbohydrates in food. They have called this our sixth taste. For your body to function properly and maintain good health, it’s important to include more healthy, fiber-rich carbs in your diet. So, carbohydrates have an important function in your body. All carbohydrates – simple and complex carbs – are converted into sugar and used as fuel for your body. The fiber in many complex carbohydrates has an important role in keeping your digestive system functioning properly and reducing the risk of cardiovascular disease. 1. Start the day with whole grains. For example, steel cut or old fashioned oats rather than instant oatmeal, or a cereal that lists a whole grain first on the ingredient list and is low in sugar. 2. Use whole grain breads. Read the product label and look for bread that lists as the first ingredient whole wheat, whole rye, or some other whole grain, or one that is made with only whole grains, such as 100% whole wheat bread. 3. Also look beyond the bread Aisle. As bread often contains hidden ingredients such as sodium, you can try instead of bread a whole grain in salad form such as brown rice or quinoa. 4. Choose whole fruit instead of juice. One orange contains twice the amount of fiber and half the amount of sugar as a 12-ounce (350ml) glass of orange juice. 5. Consume more beans instead of potatoes. Since the carbohydrates in potatoes are digested rapidly, causing blood sugar and insulin to rise and fall quickly, choose beans that are an excellent source of slowly digested carbohydrates. Beans and other legumes also provide a good amount of protein. If you suffer from diabetes, talk to your health care provider to figure out the right amount of carbohydrates for you and the portion size to match. Many common whole-grain foods, such as breads, cereals and pasta, contain gluten which is a type of protein found in wheat, barley and rye. NHS. The truth about carbs. Am J Clin Nutr. 1994 Mar;59(3 Suppl):682S-685S. DiabetesForecast. How the body uses carbohydrates, proteins and fats. Am J Clin Nutr. January 1999 vol. 69 no. 1 30-42. WebMD. Carbs for weight loss? Senses (2016) 41 (9): 755-762. WebMD. Good carbs, bad carbs. Am J Clin Nutr. 2014 Jul;100(1):278-88. JAMA Intern Med. 2015 Mar;175(3):373-84. Nutr. October 2006 vol. 136 no. 10 2588-2593. Prev Med. January 2001, vol. 31 no. 1 33-39. Carbohydrates. Harvard School of Public Health.